STAGGERING GROWTH IN ARCTIC ICE. 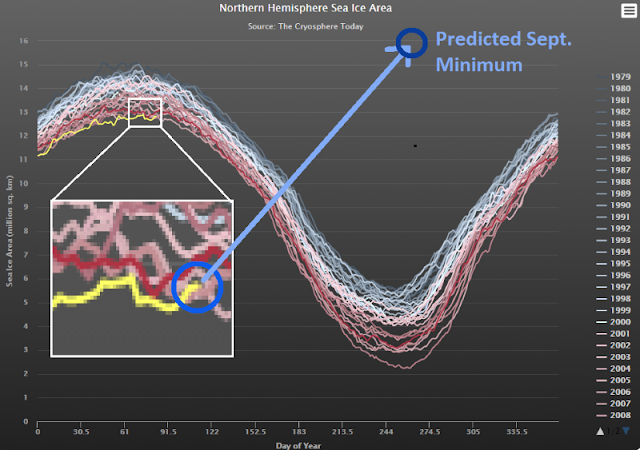 COLD WEATHER LEADS TO WINTER ARCTIC ICE GROWTH. TRAJECTORY DEFIES CLIMATE MODELS THAT PREDICT LESS ICE OVER TIME NOT MORE. From the I-Told-You-So files* comes this important piece of news. Thanks to Steven Goddard for the heads up. Something tells me we won't be hearing about this in the media or in any of Obama's speeches. This appears very much to be a menu button. Let me explain to you how these work. A menu button is a piece of technology designed to always display a menu when they are clicked on. But if you click on the University of Illinois menu button in the above image no menu appears. Go on, try moving your mouse over it and clicking, it does nothing except making the image larger. Software engineers are not like climate scientists, they have to make sure the computer programs they write work all the time, every time, and so they learn to never make mistakes. So I have to assume that someone at the University of Illinois has deliberately sabotaged the menu button. I wonder why. What could be on the hidden menu? Perhaps the menu contains links to scientist's emails which They don't want made public. Perhaps there is an option to display the real undoctored sea ice data that are being hidden from us. Or perhaps the button is just another one of Lewandowsky's little traps to try and falsely paint us as conspiracy theorists. Yes I can well imagine Stephan Lewandowsky meeting with suited UN figures at the Paris COP21 in a closed meeting room, discussing a demented form of button over taxpayer funded mugs of hot coffee. A button that can be deployed onto websites that will capture not only the imagination of climate skeptics, but also their IP addresses which are subsequently loaded into a database named agenda21. Someone more proficient at being unethical than me should probably try to hack that button and find out what is behind it. If not I sense an FOIA request in the making. *These are actual files I keep in my house, in a large binder. Update: A commenter, now banned, has kindly pointed out that a button in a copied image from a website isn't necessarily going to work when copied onto a blog. While this may potentially explain why the menu button doesn't work, I stand by my comments and the general thrust of my argument remains. I would think the University of Illinois should really put a disclaimer on their website pointing out that buttons will not work when an image is taken. This kind of lack of attention to detail is becoming a hallmark of climate science. A simpler explanation for the menu button is that menu buttons only work on the original website they exist on! What you've done is taken an image of the website and put it on your blog. You therefore get an image of the button, not the button itself. Clicking on the button image will just click on the image. This is entirely expected behavior. There is absolutely nothing wrong here and you should apologise to the University of Illinois. So you "believe" that they "forgot" to embed a menu button hyperlink in their image, before putting it on the web. How "convenient"! Sorry Johnny-Boy, but I'm not buying that parcel of "Florida swampland" that you're peddling. Far too sloppy and careless of them. We're smarder than that! Good to see you banned that trouble-maker Johnny White. Obviously a troll. "Johnny White" is obviously a sock-puppet whose real identity is easy to see: two syllable first name, single syllable surname - just like that Marxist, Michael Mann. He even used exactly the same number of letters in his sock-puppet name - thinking that adding an extra letter would throw us off the scent. Nice try. While I applaud the use of fossil fuel industry sympathetic mathematical methods, I am not sure if the GWPF hasn't recently claimed this particular method of creative extrapolation for themselves. My local Chinese restaurant has a secret menu. Obviously they are up to something. You can tell its an CAGW alarmist graph as they always have hockey stick shapes. They have tried to confuse the public by making it look like a sine wave but I can still see give away hockey stick they always start the lies from. The color ice is never pink why do they have pink on a graph of ice? Ice is white so it is obvious that if the graph was true to life it too would be white. They are so dishonest producing such obvious rubbish do they think we are stupid? Your hypertastic bombshell prediction of a new ice age later this year (beautifully emphasized by COLOUR ALLCAPS) is a good example of straight-line extrapolationism in the acreage of predictive science. Far better than an overly complex computer model that uses millions of data points from dozens of variables. Each data point comes with a margin of error and if you multiply all these margins of error together, they swamp the supposed trend you are trying to reveal. Far better to have just three data points, (y1=Yesterday, y2=Today, y3=September) to minimize the error. Your second point makes it clear that climate scientists go to great lengths to hide their inaccurately fabricated data. It has been reported by reliable infiltrators that they now use covert non-digital communication methods like PENS and PAPER, FACE TO FACE MEETINGS, and, wallowing in the abyss* of moral depravity, MANUAL TYPEWRITERS. We have to find out who is selling and buying typewriters, and take control of the "underground" ink ribbon pipeline. In the name of all that is Holy, we have to do this NOW!!! *One of my favorite words, along with "vile", "hideous" and "abomination". "Abomination" is a great word to use at the office, at Walmart and at children's birthday parties. Let me channel Judith Curry here: Very interesting. The University of Illinois menu button is obviously a mark of shady ne'er-do-wells at work. I managed to hack into the University's web site and examine the functionality hiding behind the button. It reveals - wait for it - access to the very same image but with a very telling difference - the menu button has disappeared!! So this is the proof positive. Such a situation is entirely indicative of deep conspiracy. Remember the N.S.A. which stands for "No Such Agency". A button that disappears itself has got to be the mark of a serious cover-up. 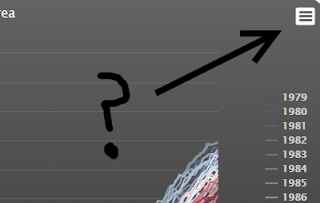 Yes but what is to explain the mysterious change in the recent upward trend from yellow to blue in your projection? I'm so glad that Inferno is back to show us the light. Frankly, all the warmist talk about sea ice and temperatures in the last while has left me totally limp. Blog science does a wonderful job on my libido. Anyone else notice that, not only does the graph look suspiciously like a chemtrail, it's actually in exactly the same colours as the various salts of barium? We've known for a long time that the climate scientists are secretly poisoning the arctic with toxic chemical sprays, using hundreds of trillions of dollars of taxpayers' money. I'm just surprised that they're now being so blatant about it. First of all, I just want to say thank you for the time you have put in completing this one of the unique blogs that I have read this week and love the way you present your blog and also feeling very glad that there are some brilliant author like you are still writing and guiding the people in a better way. Love to see more from you in future so keep sharing more and more. Thanks for sharing this lovely post with us and I am so amazed to see such kind of talent everything in this post is placed appropriately from its presentation to writing everything is in proper place. Hope to see more form you in future so keep sharing more and more. with other this website visitors. Anyway thanks a lot one more time for the great and informative publication. And I will definitely be waiting for more such nice posts like this one from you. Kind regards, Peter Rickson. Thanks for share, It's useful. Riddle School is one of the top quality puzzle games in which you will control a student in order to run away from the school to fight against aliens. This is the third game of the series and in case you are a fan of puzzle games then you are going to love this game a lot. You have to use your practical intelligence as well as collect items from the school in order to find your way to the freedom. You will start in a class where the teacher is teaching and your first mission is to leave the class. Dressing Games - 6zar online free games is a great place to play Dressing Games. Sift Renegade 3 is a fighting game which you will play in the past unlike the rest of the games of the series. You will control Kiro and meet with your brother in the past. In addition to these, you will find new weapons and new combos to perform on your enemies in this game. In case you have never played the games of the series, this may be a good choice for you to start but if you are going to stick to the story, it will be good to start with the first game. Brave Shorties 2 is a strategy game where you will fight on your lands against various enemies. The map is divided into three sections where zombies, Vikings and forest creatures are available. You will have to beat your enemies one by one on stages in order to successfully finish the game. You will spawn your soldiers and you can equip them with items which you will find them by killing your enemies. In the event that you are looking for a fun strategy game then you can try the second game of the series which we believe you will like it. Stunning post!!! Thanks for sharing with us. I've been looking for info on this topic for a while. I'm happy this one is so great. Keep up the excellent work.